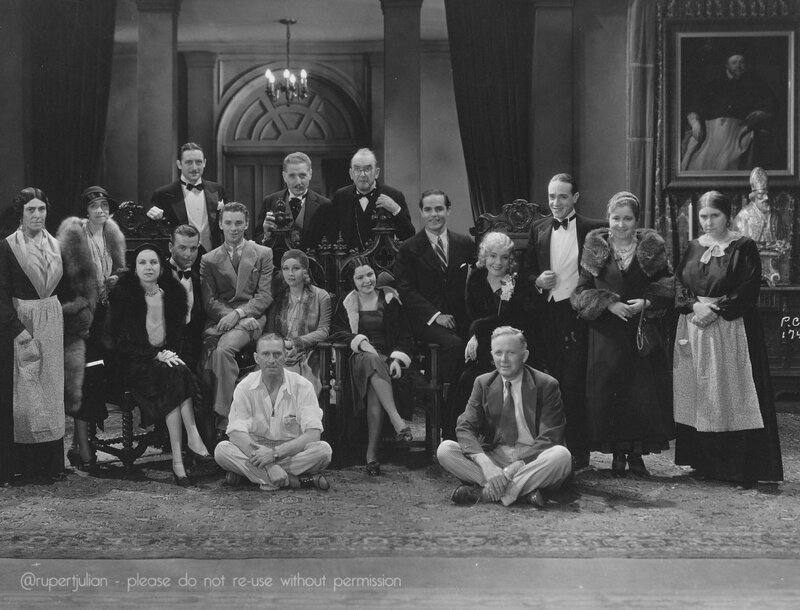 Rupert Julian (seated on floor, left) with the dual cast of The Cat Creeps. There's a trailer for it online - which seems to be most of what survives of the film, unfortunately - but what I hadn't heard about was the Spanish language version, made at the same time on the same sets, directed by someone else entirely. So here we've got both casts, possibly in mirror image, with both directors together on the set! I can't say I knew anything about George Melford before, but he had a long career in parallel to Rupert's - starting in the early teens, and continuing until 1937. His version of this film seems to have come out under the title 'La voluntad del muerto', which translates as The Will Of The Dead; but it's definitely based on the same original novel. I'm not sure I can guess the names of everyone in the images, but it's interesting to see Rupert towards the end of his career at very least! I don't know what made him finish with this film - many silent directors didn't transition well into the talking picture business, but that's pure speculation of course. I'd love to find out, one day! One last thing - here's the cover of Film Daily magazine from October 1930, showing the film on the front page. Nice to see Rupert back at Universal, if nothing else; obviously he & Carl Laemmle had made peace after Phantom Of The Opera, by then!